Sometimes, you’re on the go and don’t have time to type or tap and fix notes in Evernote for your Blackberry device, particularly with the “help” of autocorrection. You spend more time fighting your keyboard than getting stuff done. If you’re hurrying to your next location, recording voice notes is the perfect way to catch your thoughts before they flit off into oblivion. 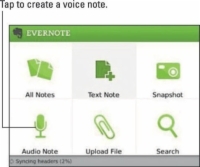 If you want to add notes or text to any of your recordings, you can do that, too. After you create your recording, just click in the note area and begin typing. Best of all, you can add the text from any device, not just desktop computers or laptops. 1Tap Audio Note on the Evernote home screen. 2Tap the Voice Note icon to begin recording. The recording starts as soon as you tap the button, so make sure that you’re ready. 3Tap Stop when you’re done recording. You can play the audio back by tapping the audio portion of the note. Then you can decide whether to rerecord or save what you have. 4When you’re satisfied with your recording, tap the BlackBerry button. 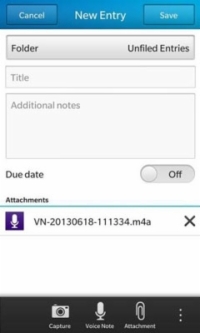 The recording is saved to the new note.